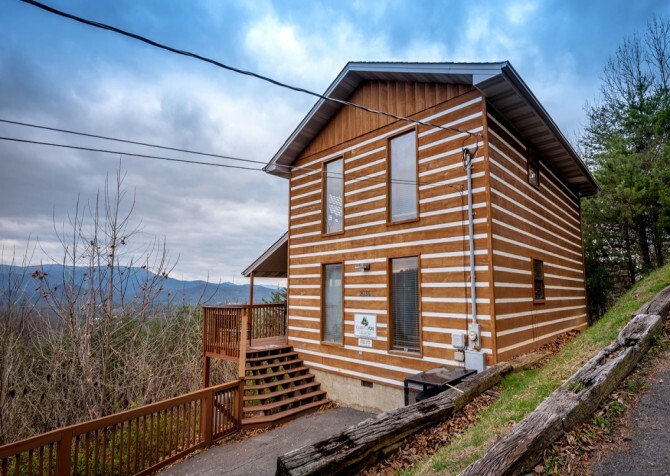 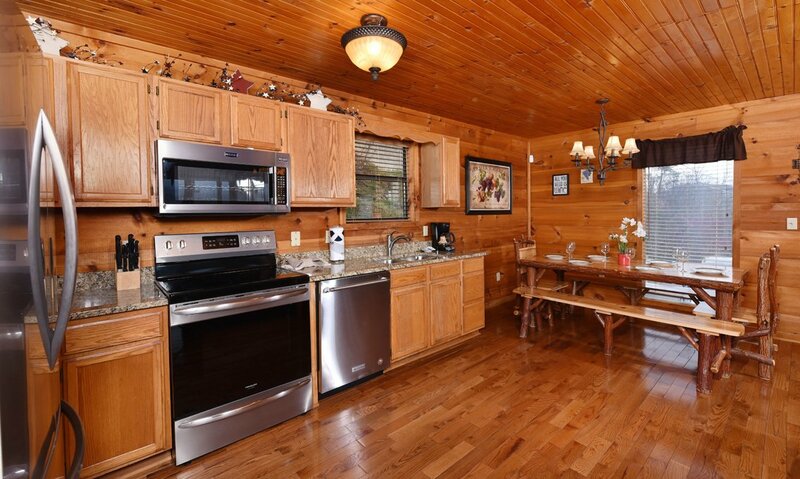 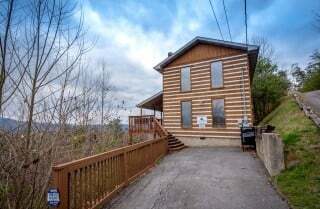 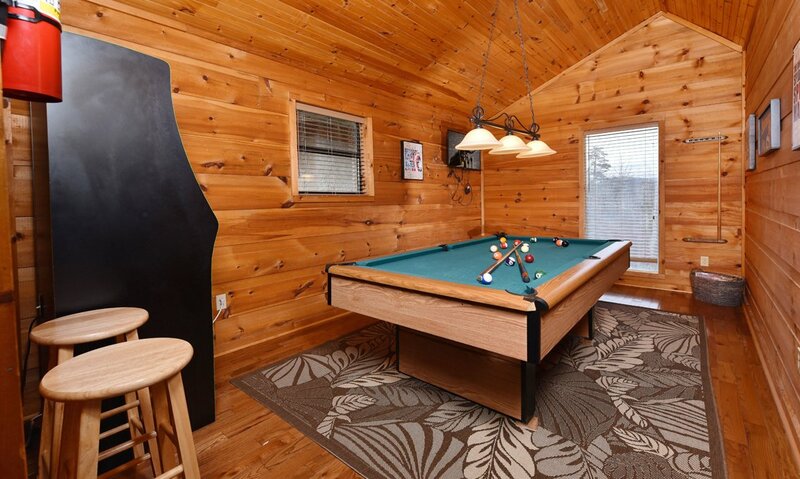 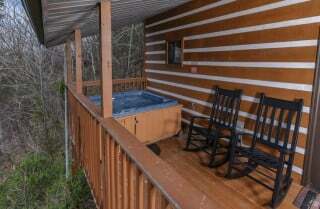 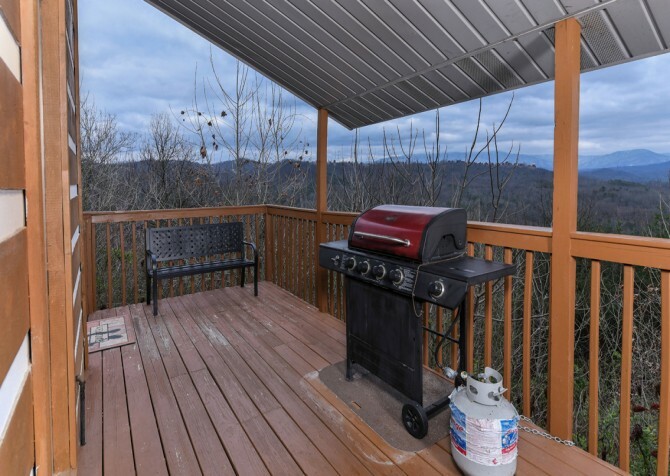 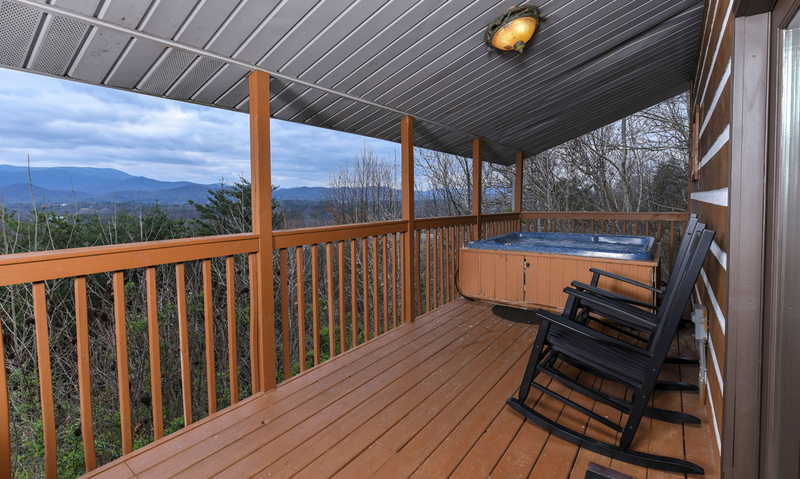 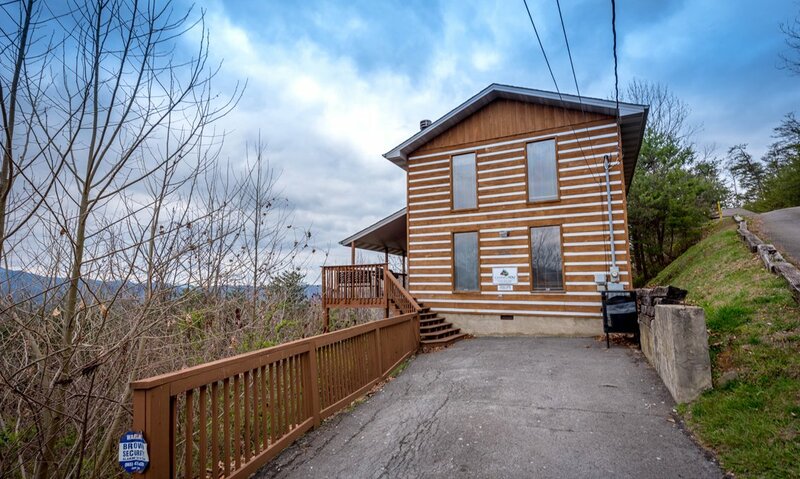 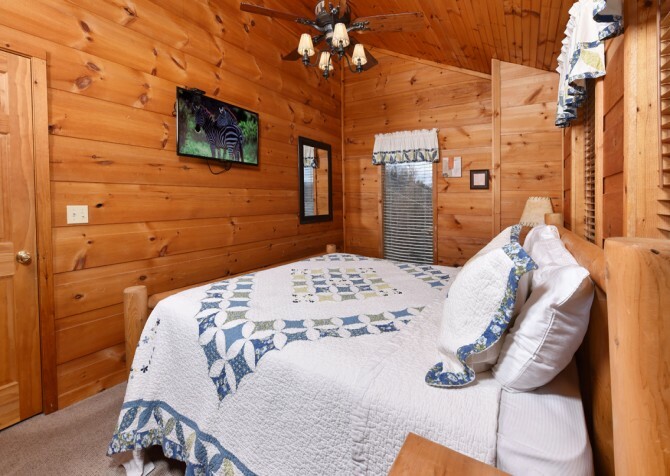 Enjoy a relaxing vacation at Smoky View Straight Up, a Pigeon Forge home with spectacular wooded and mountain views and exceptionally entertaining amenities for all! 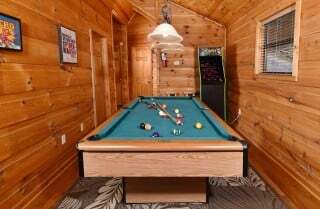 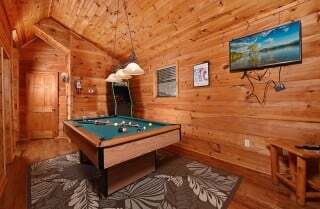 Host a game tournament in the rec room, a barbecue party with the charcoal grill, a spa evening in the indoor jetted tub, and movie night on the big screen TV. When the little ones head to dreamland, bust out the champagne, soak in the outdoor hot tub, chat by a warm fire, and hit the hay yourself on the king-size bed. 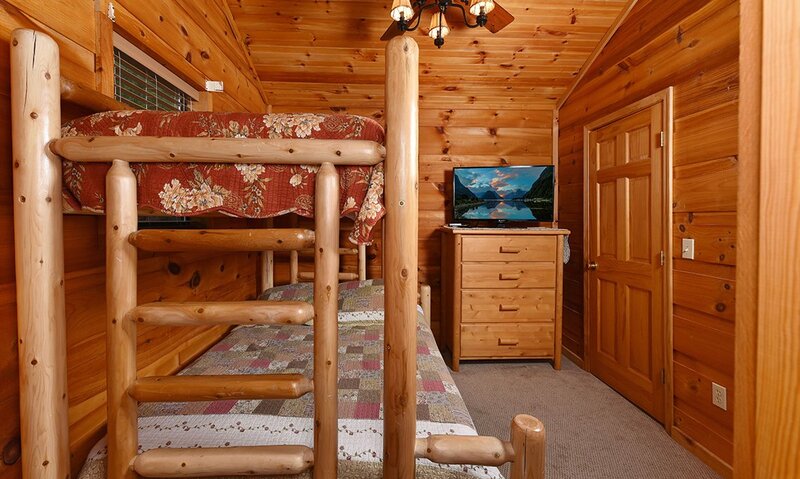 Endless options are yours when you stay at Smoky View Straight Up! Pause to take in the stunning mountain views before entering the cozy living room, featuring an open floorplan to keep the whole crew connected. 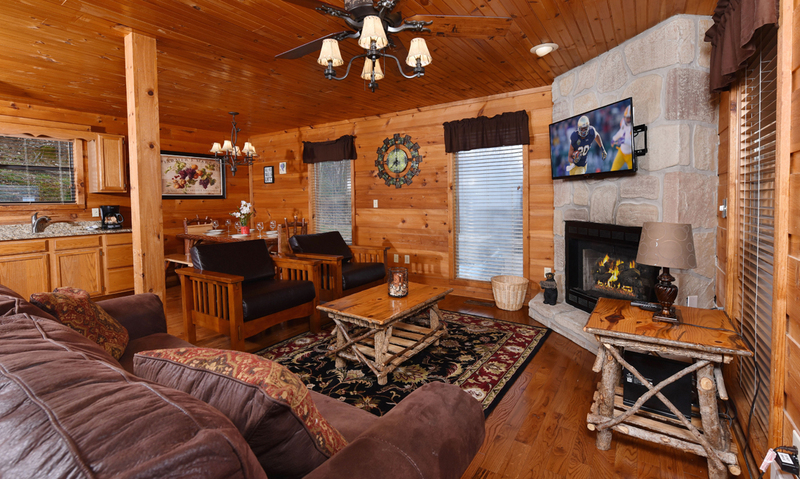 Make yourself at home on the couch (which doubles as a sleeper), rest your feet upon the soft area rug, set out an array of snacks on the coffee table, and switch on the big screen TV. Feel free to flip on the ceiling fan if booing the feature film villain becomes a bit lively. As evening approaches and cooler air sets in, get a toasty fire going in the gas fireplace, pour a local bottle of red, and chat with your bestie in the 2 arm chairs. 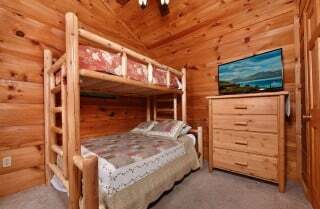 Feeling too excited to sleep? 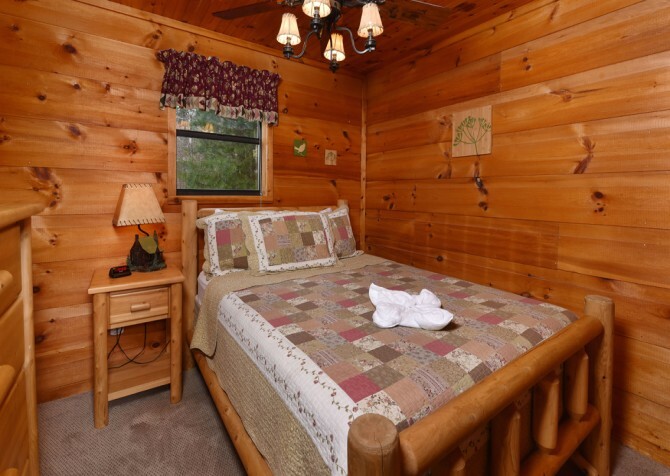 Bring out your favorite board game or enjoy a romantic read until dawn. 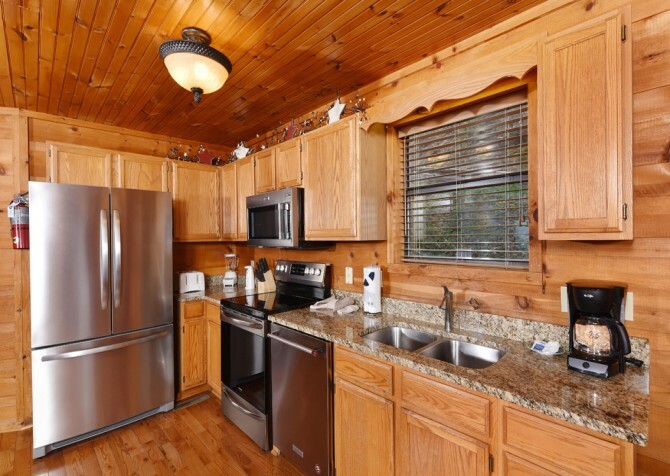 Mere steps away from the living space awaits the fully equipped kitchen, boasting stainless-steel major appliances — ready to prepare hearty feasts, simple meals, and midnight snacks! Store restaurant leftovers in the fridge, pop a movie-night favorite in the microwave, bake fudgy brownies in the oven, wash fresh raspberries in the double sink, and let the dishwasher clean up every night. When morning comes, brew a pot of joe with the coffeemaker, blend a fruit smoothie in the blender, and fry eggs and bacon on the stove. 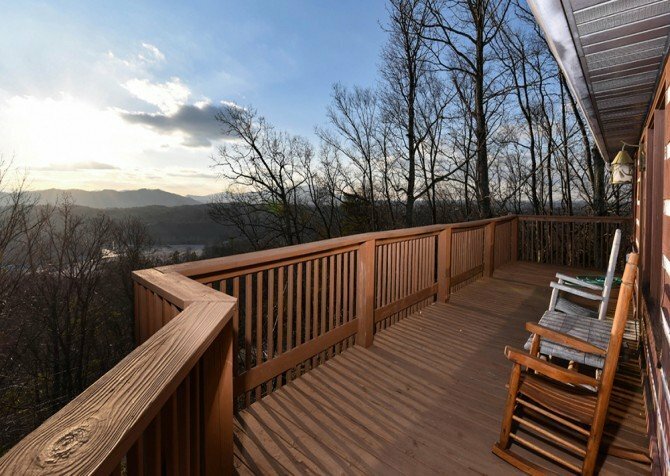 After fueling up on breakfast, why not head to the Great Smoky Mountains National Park for a tranquil stroll? 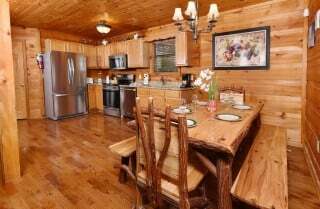 Set the wooden table — inspired by nature itself — in the dining area just off the kitchen for mealtime with the whole family. Harboring 2 end chairs and 2 matching benches, everyone can easily scooch in for a homecooked meal. After dinner is done, clear the table for a card game or coloring time with the kids before bed. 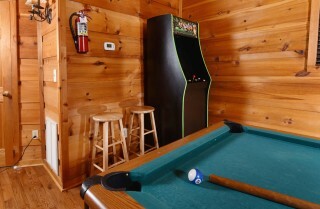 Be sure to head to the rec room upstairs for a friendly pool match or a competitive arcade battle. 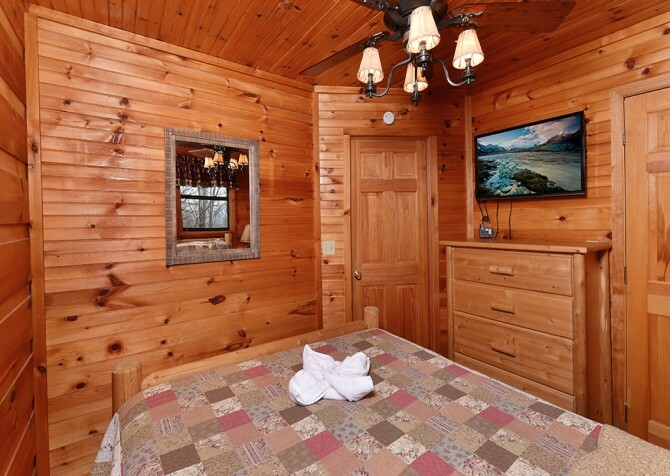 There’s even a mounted flatscreen TV to keep you entertained for hours on end. Cheer for your favorite team, shoot your best round, and beat the highest score — all in one afternoon! 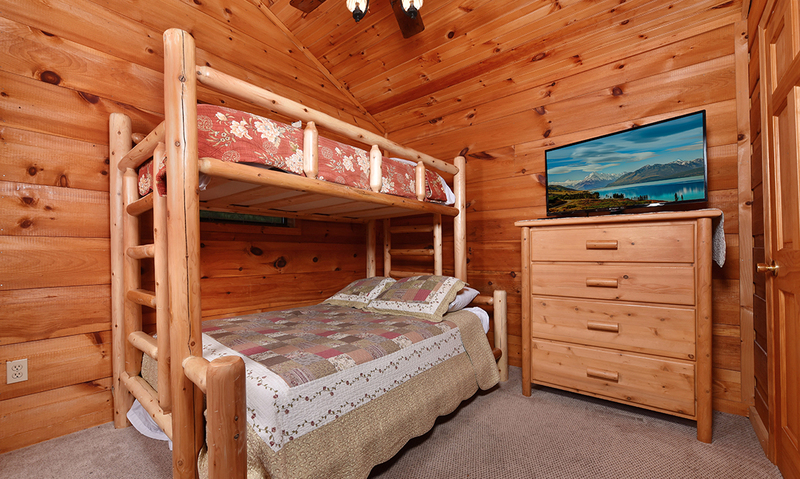 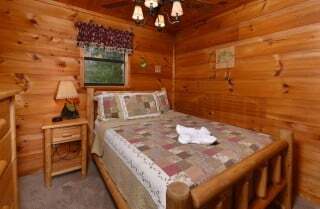 Accommodating up to 8 guests, this mountain home harbors a sleeper sofa in the living room and 3 comfy bedrooms — 1 with a king-size bed, 1 with a queen, another with a twin-over-queen bunk, and each with their own flatscreen TV! 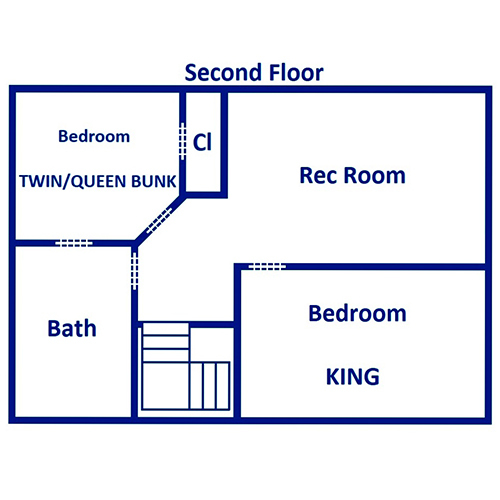 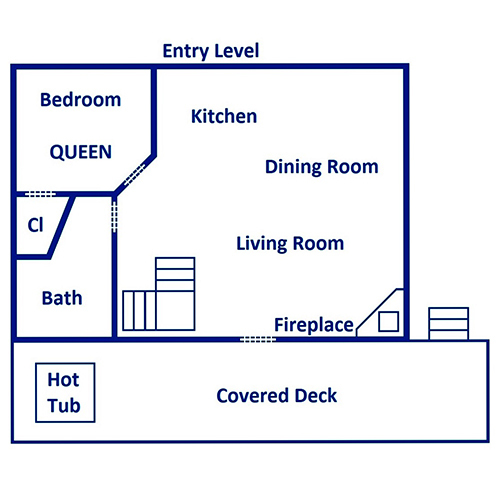 There are also 2 bathrooms: a tub and shower combo rests on the entry level, and a full bathroom with a jetted tub awaits upstairs as an en-suite to the bunk room. 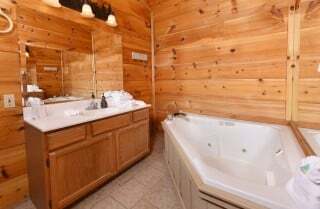 Spend mornings sleeping in, evenings unwinding with natural bath salts in the jetted tub, and nights snuggled up for a good film in bed. 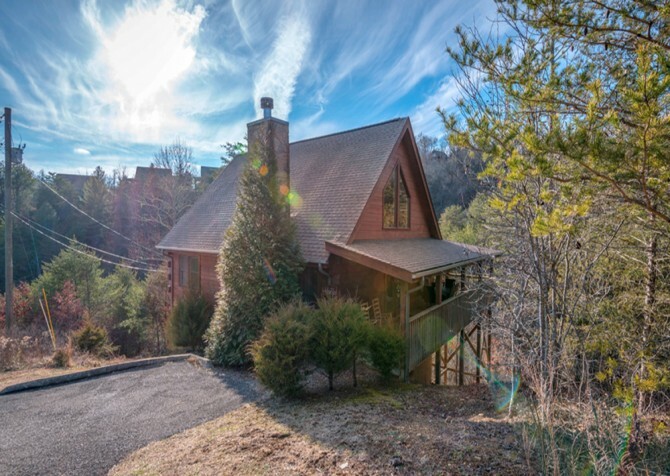 Although the paved driveway may be steep, the beautiful mountain views are well worth the trip! 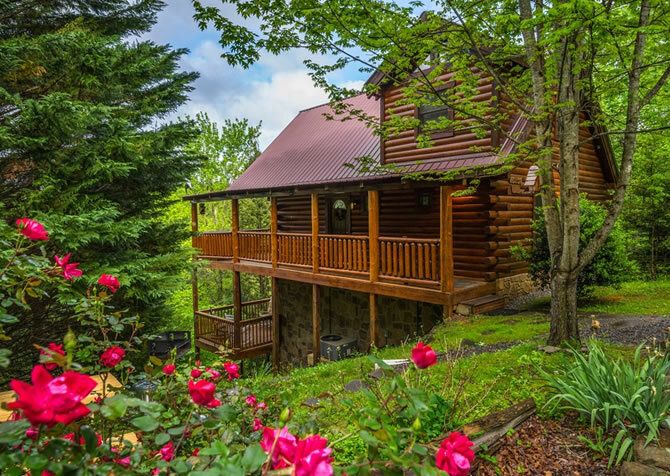 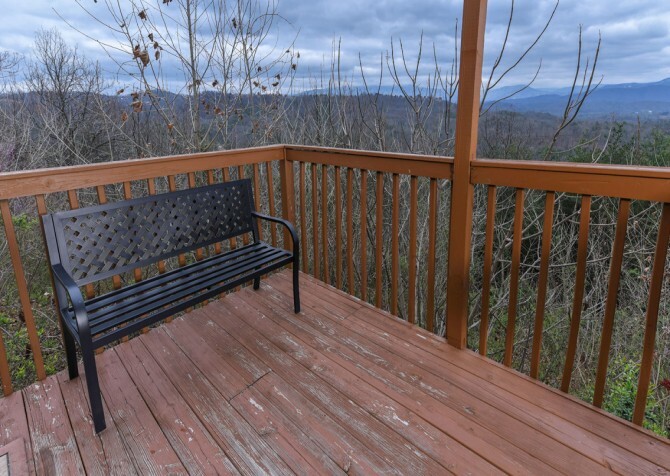 After the cars are parked, head 8 steps up to the back deck and soak in the glorious mountain and wooded views from the bench or rocking chairs. 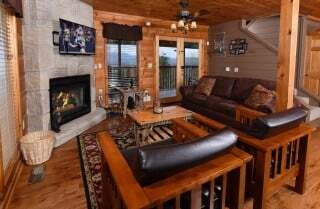 From the living room, bring the Smoky Mountains indoors by opening the French doors to the covered deck. Plus, the smell of barbecue from the grill will entice the whole gang out of the rec room — a tough job, indeed. When evening sets, hop (slowly) into the outdoor hot tub to relax…paired with a lovely mountain view, what could be better? *Roads to the cabin are steep, and parking includes space for 2 cars if parked end to end. 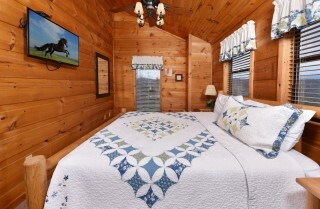 Want to feel right at home when you’re away? Don’t forget to stream the latest episode of your favorite TV drama with the complimentary wireless high-speed internet! 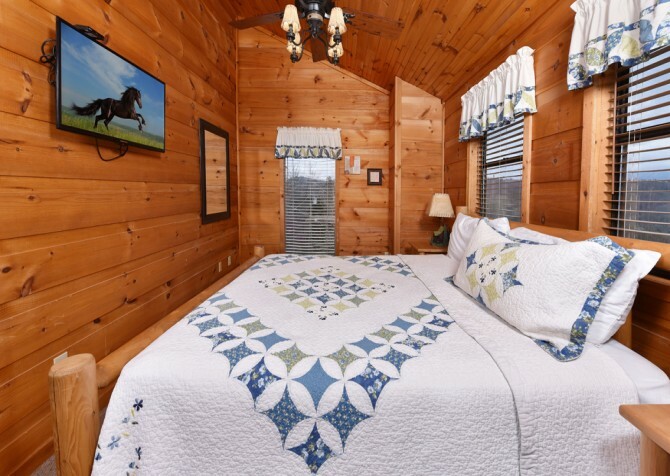 When you muster up the desire to leave your cozy vacation home, head to Pigeon Forge for fun activities and adventures in town. Summertime is swimming time at Dollywood’s Splash Country, a waterpark with a wave pool, lazy river, slides galore, and even more! 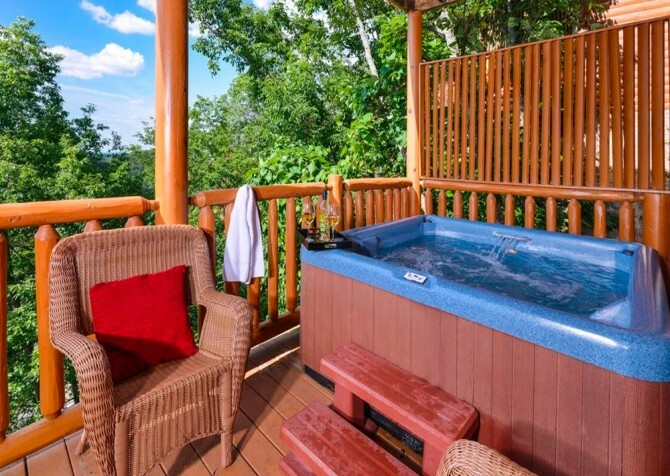 View a replica of Thomas Kinkade’s Stairway to Paradise, enter delicately designed parrot cottages, and meet tropical birds of all kinds at Parrot Mountain and Garden of Eden. Take your whole family to jump high and climb even higher at TopJump, an indoor trampoline park and climbing center with an arcade and a candy shop.